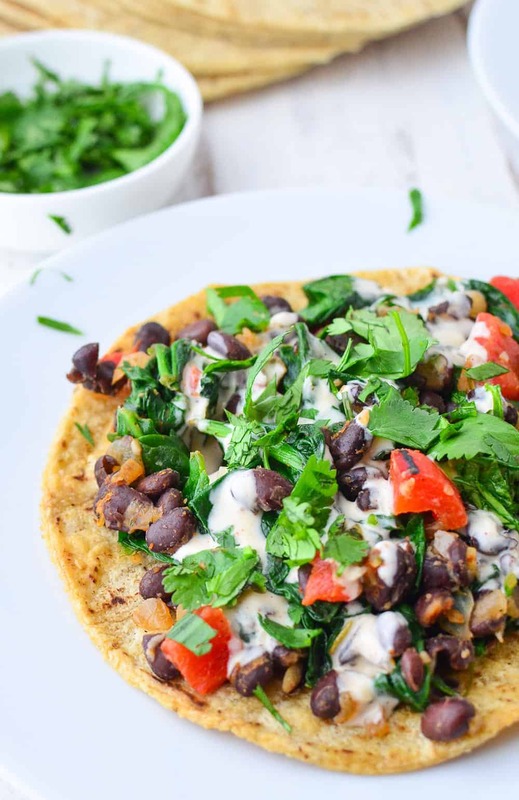 Smoky Black Bean Tostadas! Black bean and spinach filling topped with a smoky paprika sauce. Vegan and gluten-free. 1. I could eat it just about every single day and not get tired of it. I’ve also learned that Mexican food tends to get a bad rap for being unhealthy, which is understandable considering that most restaurants serve everything covered in cheese, loaded with sour cream, and all-you-can-eat tortilla chips. Delicious? You bet (and essential after one too many cocktails the night before). Healthy? Not even a little. Lightened up Mexican fare, here we go. These tostadas are crazy good! 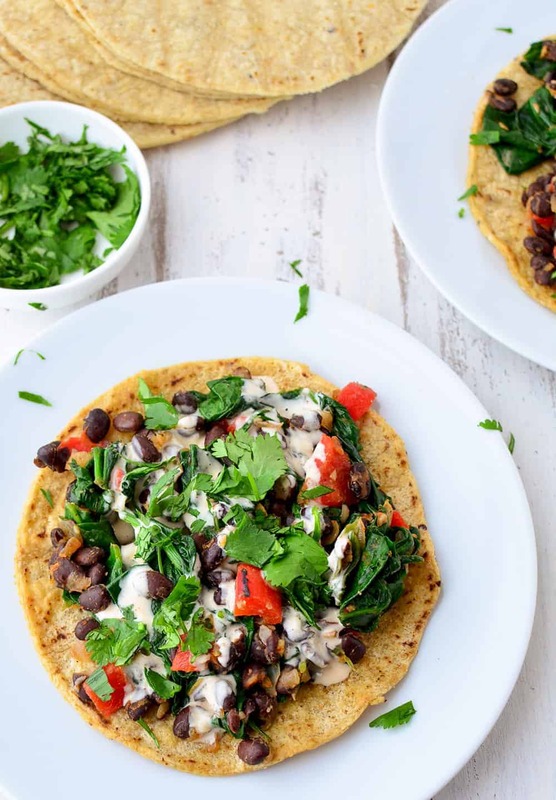 A faux-fried corn tortilla piled high with smoky black bean & spinach filling and topped with a smoked paprika-lime sauce. You know I am a sucker for sauce, and this one does not disappoint. Smoky, citrusy and creamy. Forget the cheese and sour cream, this sauce is all you need. The real star of this dish is the generous use of smoked paprika. I love the lightly spiced flavor of smoked spanish paprika and have been known to add it to just about every dish I make (ah-mazing on scrambled eggs). There are a few spices that I think are worth spending a little extra dough on, and smoked spanish paprika is definitely one of them. I picked up a few of these containers when we were in Barcelona last year and have been savoring every shake. It’s also a night and day difference compared to the regular paprika I was using. Convert! Your taste buds will thank you. To keep these on the way healthy side, let’s faux fry the tortillas instead of deep frying them. Same awesome flavor, none of the fat! Aha! Trickery. If you aren’t in a faux fry kinda mood, then just bake your corn tortillas like you normally would or wrap things up in a flour tortilla or lettuce wrap! You can get as healthy as your heart desires. To keep the fresh flavor explosion going, make sure to add fresh cilantro and a squeeze of fresh lime juice! Healthy Mexican food! You are the best. Weeknight comfort food! Cheesy polenta bowl topped with roasted tomatoes and mushrooms. Vegan and Gluten-Free. Finely mince (I use a microplane) 1 clove garlic. Place the garlic in a small bowl and whisk in the mayo, 1 tsp. smoked paprika, and juice of 1 lime. Season to taste with salt and pepper and set aside. Lightly grease a sheet pan with 1/2 tsp. olive oil. Place the tortillas on the sheet pan and drizzle with the other 1/2 tsp. olive oil, coating both sides. Bake for 5-6 minutes until golden, flipping halfway through. Remove from oven when done and set aside. Heat a large skillet over medium heat. Add 1 tsp. oil and the finely diced onion. Cook for 5 minutes until soft and translucent. Finely mince the remaining 4 garlic cloves and add to the skillet, cook for 30 seconds and add the spinach leaves. Add the black beans, chopped roasted red pepper and 1 tsp. smoked paprika to the skillet, stirring occasionally until the beans are heated through. Using a wooden spoon, potato masher, or fork, lightly mash 1/2 of the beans and stir into the spinach. Assemble! 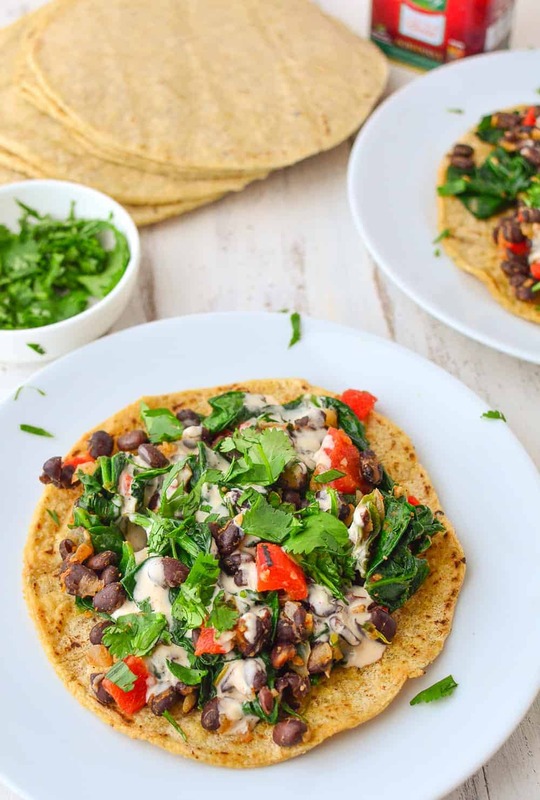 Divide the spinach-bean mixture on the tortillas and top with the paprika sauce and chopped cilantro. Ready for more smoke and spice? Enjoy the roundup below from healthy living bloggers for this month’s Recipe Redux link-up! I love the look of these Alex – so vibrant and fresh. 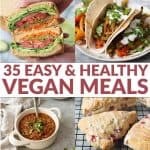 I could eat mexican food everyday too and love every single bite! This looks delicious. Pinning for next week’s menu planning. These tostadas look amazing! I’m also a lover of Mexican food and actually have to make an effort to not make a Mexican dish every single night! Can’t wait to try these!! I’m with you and could eat Mexican food all day. Love the combo of ingredients in your gorgeous recipe! Yummm! Looks delish. Love all the cilantro on top too! These sound and look great! 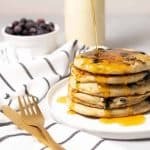 This recipe looks utterly delicious! I agree with you, you can’t go wrong with Mexican food. Yes! Rule #2 is essential! I love making healthier homemade Mexican food at home. Smoked paprika is one of my new favorite spices. It really takes a recipe up a notch. Mexican.. yes please! I’ve never met a Mexican dish I didn’t like, these sound great! Margaritas and Mexican, #winwin! This is why we are friends. I can’t imagine mexican food without margs or tequila. Seriously. Oh man, these look amazing!! The sauce sounds crazy good and I can never get enough cilantro! Me either! I used to hate it as a kid but now I pile it on everything!